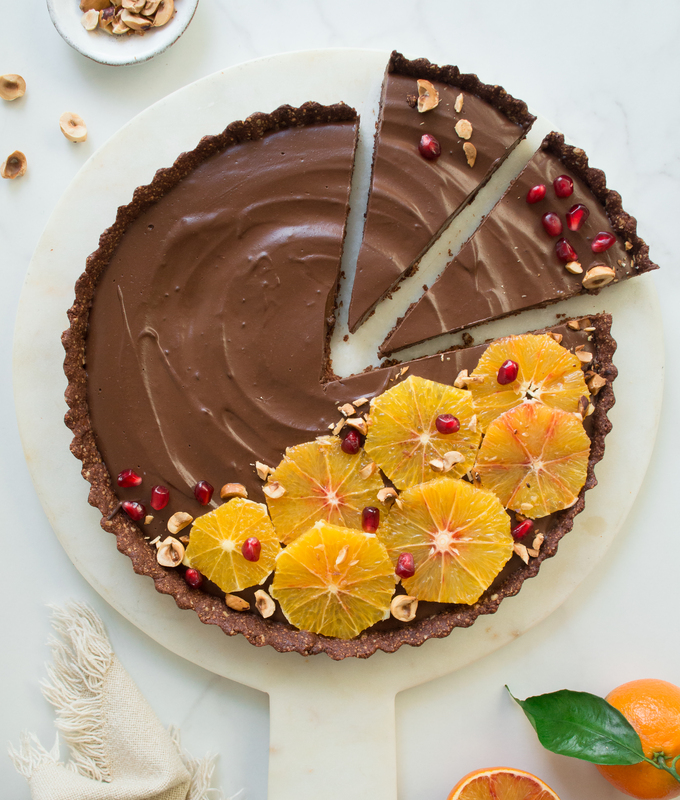 Crunchy hazelnut & cacao base combined with decadent, creamy & smooth chocolate & blood orange filling, this tart is a divine marriage of fresh & zingy citrus and velvety rich dark chocolate. A perfect fuss free chocolate dessert for Valentine’s day. Vegan, free from gluten & refined sugar. Well, I’ve taken an unplanned break from posting on the blog for a few weeks but what a recipe to come back with! 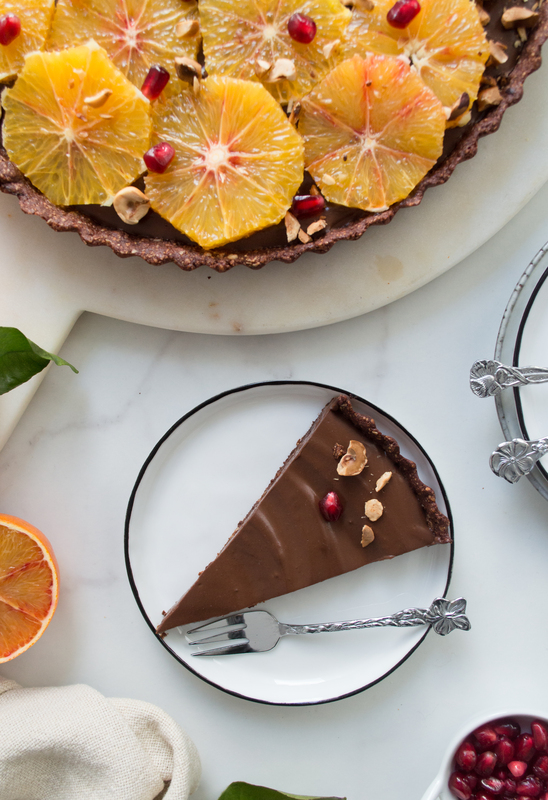 If there is just one sweet recipe on my blog that you should try, it has to be this decadent chocolate & blood orange tart. And with Valentine’s Day just round the corner, this is definitely THE way to your lover’s heart! Oh, and by the way, dark chocolate is a natural aphrodisiac if you didn’t know, so you’ve got that Valentine in your bag, so to speak! 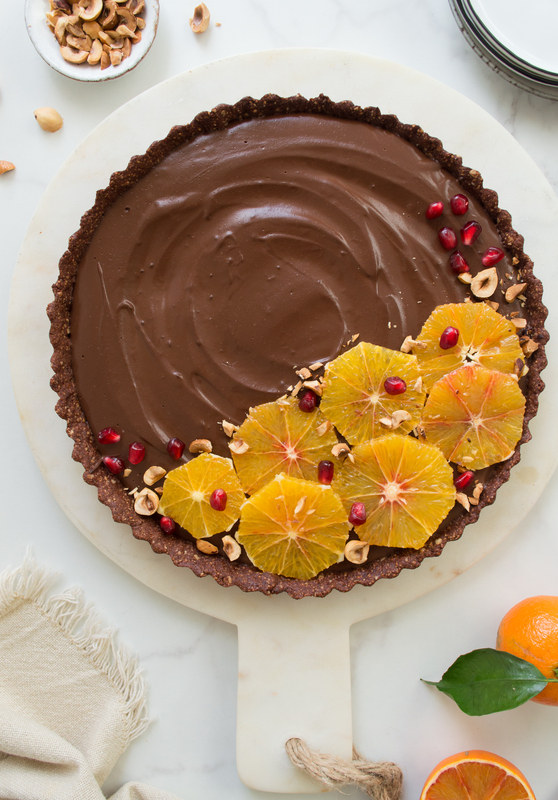 Crunchy hazelnut-y base combined with decadent chocolate & blood orange filling, this tart is a perfect marriage of slightly sharp and zingy citrus and rich dark chocolate flavours. And even better, it’s free from refined sugar, gluten free and vegan friendly too. Now that I’ve got it out of my chest, let’s get down straight to this bloody amazing chocolate & blood orange tart, shall we? I took inspiration for the filling of this tart from Mei’s original recipe here. Just a few notes on recipe adjustments. As they are currently in season, I used blood oranges in the filling, but feel free to use ordinary oranges. They’ll do just well. You might have some chocolate & orange filling left over but don’t throw it away – it works as perfect frosting for cakes or, if you feel like indulging a little, spread it over your toast instead of Nutella, it’s just as delicious! 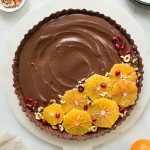 This chocolate & orange tart is a perfect party dessert (especially a good one for Valentine’s day for sure), as you can prepare it the night before, so it’s less cooking on the day. When it comes to decorating your tart, you can use any fresh fruit and berries in season, anything will go. Without further ado, let me take you straight to the recipe. Indulge, enjoy and savour every mouthful. I’d be beyond grateful if you shared your comments with me in the comment section below. And don’t forget to tag me on social media @fit.foodie.nutter so I can see all of your beautiful creations. 1. Preheat the oven to 170C fan. Grease the 23cm (9”) tart tin with coconut oil using the pastry brush and set aside. 2. Combine roasted hazelnuts, cacao powder and porridge oats in a food processor and blitz until fine crumbs. Add dates, maple syrup and coconut oil and process until the mixture turns into sticky dough. Transfer the dough into the tart case and spread evenly round the base and sides of the tin by gently pressing and flattening the dough with your fingers. Gently prick the base of the tin with a fork and bake in the oven for 10-12mins until the crust is slightly brown on the sides. Remove from the oven and let it cool down completely whilst still in the tart tin. Release from the tin when completely cool. 3. In the meantime, prepare the filling by combining coconut milk, maple syrup, blood orange juice, melted dark chocolate & cacao powder in a saucepan and whisking over medium heat. As soon as the mixture starts to bubble, whisk in cornstarch and agar agar powder and let it simmer for 2-3 minutes. Take off the heat and cool completely. 4. 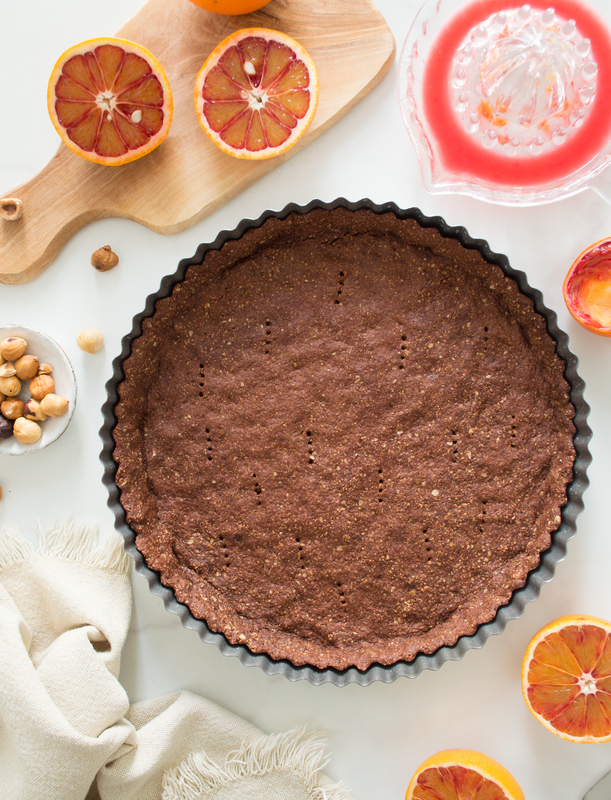 Once cool, fill the tart with blood orange & chocolate filling taking care not to fill too high up the sides. 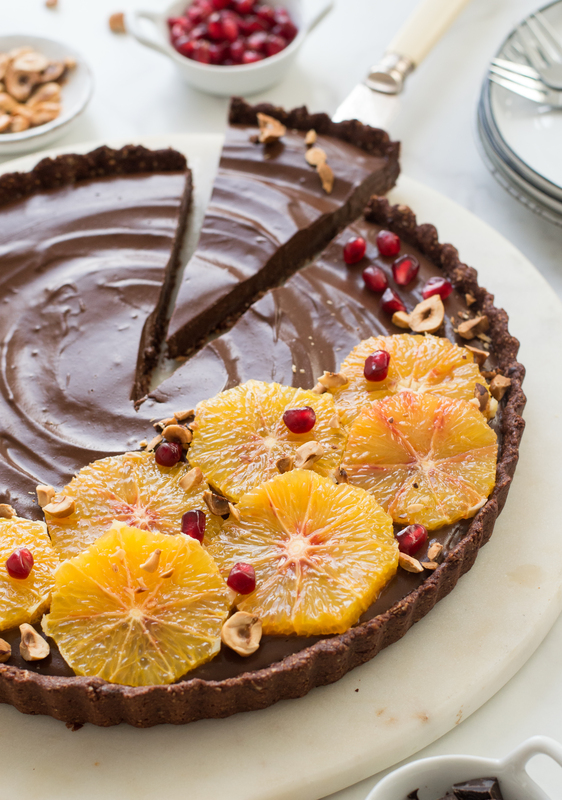 Decorate with fresh orange segments, roasted hazelnuts and pomegranate seeds. Chocolate and orange go perfectly together. Your tart looks and sounds decadent and delicious, perfect for a special occasion dessert. OMG!!! I’m lactose intolerant and you have just officially made my year – THANK YOU!!! This is so chocolatey and delicious. 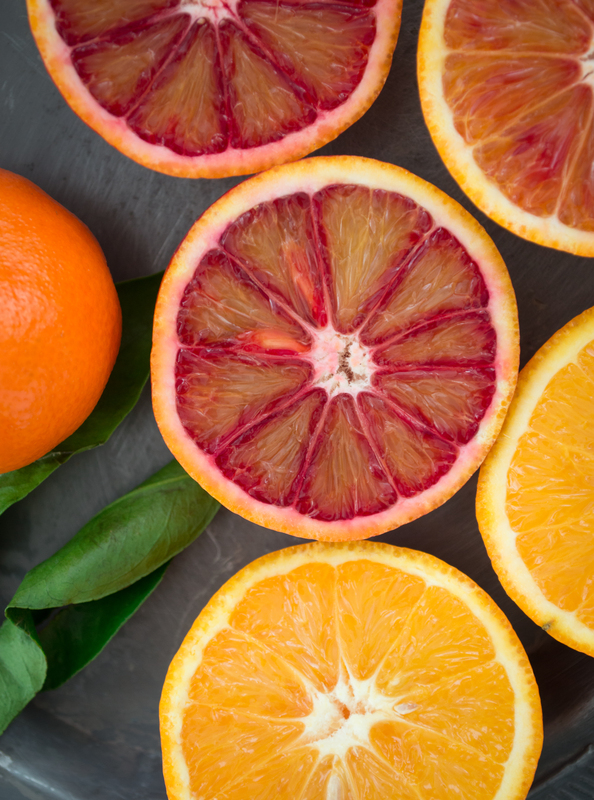 Such a perfect mix with the blood orange. Loving the flavor. This won’t last long. 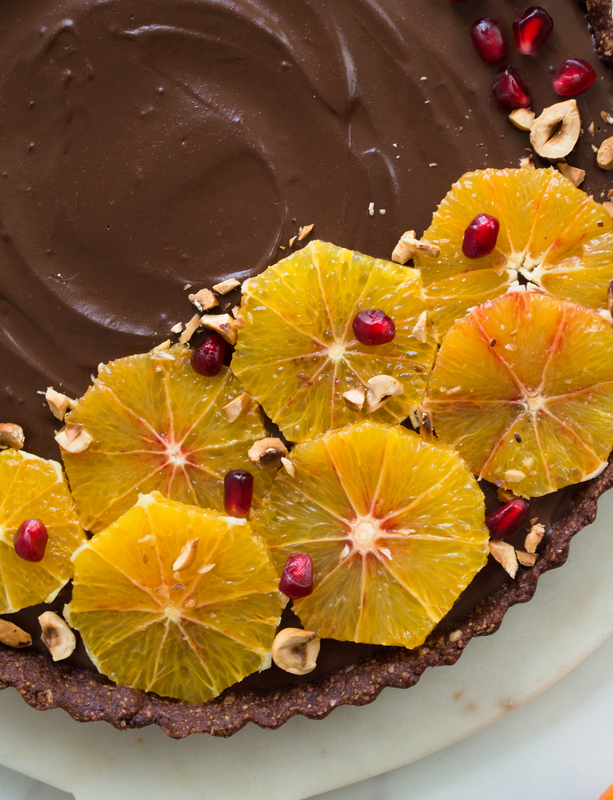 The presentation of blood oranges on the chocolate tart looks outstanding. And the fact that there’s no dairy in the recipe makes it even better. There’s something so wonderful and perfect about the combination of orange and chocolate. This tart is to die for. Everyone should make it today! A skin is forming as it cools, what do I do with it? Hi Carole. You should be able to get rid of ‘the skin’ just by whisking or stirring the mixture gently. The skin is forming when the mixture is setting, so it’s completely normal. Let me know how you got on with it. 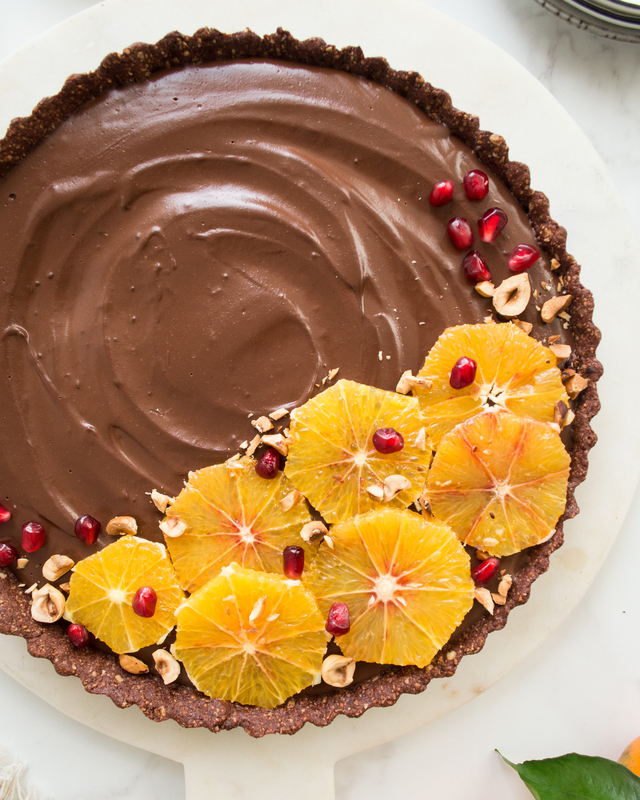 I love combining orange and chocolate and this vegan tart recipe looks delicious! Gonna be trying this soon! Thank you so much Marly! And I totally agree – chocolate and orange is one of the best combinations for sure!